Enter your e-mail address below to have your password reset. You will receive an e-mail with a new temporary password in it. Your new password is on its way. If you have problems accessing your account, please contact us at 1-888-757-4774 and we'll help you out. I'm sorry, your e-mail was not found in our system. If you think this is a mistake, please contact customer service at 1-888-757-4774 or via e-mail here. Sign in to access your account and complete your order. You will have the option to create an account on the order confirmation page. Andy Sullivan, owner of UK plumbing company Leak Busters, was working a job like any other. As he went about his business he noticed an elderly woman sitting outside her home across the street. She seemed sad and Andy overheard that she was all alone in her big home most days. Most people would have felt bad for her and moved on with their lives, but not Andy. 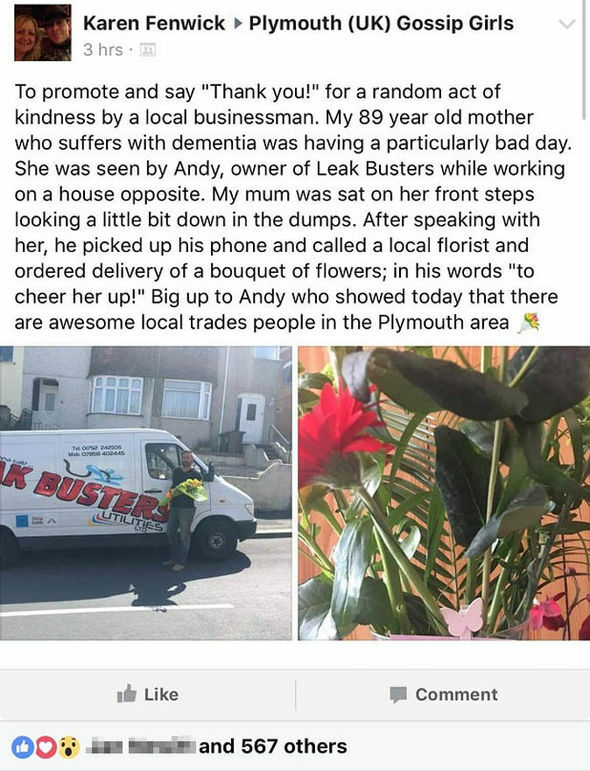 Something about her stuck with him and he decided to get her flowers to try to cheer her up, a small random act of kindness for a stranger. Expecting nothing from it he bought the flowers and brought them to her. When he was bringing the flowers in he ran into the woman’s daughter, Karen Fenwick, who convinced Andy to let her take a picture of him and the flowers to share on Facebook. Karen’s mother suffers from dementia and doesn’t get treats like this too often. The flowers made her day and brightened the day of their entire family. After posting the picture and sharing the story on Facebook it spread like wildfire, quickly reaching thousands of people across the world. This goes to show you, even a simple nice gesture can positively touch the lives of way more people than you expect. Being kind is easy so why not work towards a nicer world? The story doesn’t end here! Click here to see how this Kind Plumber’s Karma Pays Off! Us at SupplyHouse.com work by a set of Core Values that support these kinds of actions. Check us out when you need any plumbing, heating, or HVAC supplies and as always, be good to each other. Awesome gesture. Its the simple things that can make the biggest impact.